Since I can't read Russian, and therefore can't record the manufacturer and other information basics about this bar, I'm including this slinky number just for fun today. Russian chocolates feature some great paintings and illustrations that I don't often see on packages of U.S. chocolates (anymore?). Despite being past its due date and having an ever so slight perfumey aftertaste, this bar wasn't bad. Where else but in the world of chocolate can you go from Russia to New Guinea to Orem, Utah, in just a few bites? 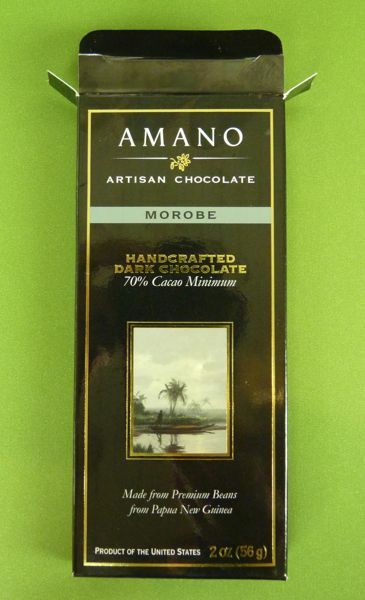 Today's dark chocolate (70% cacao) Morobe bar from Amano Chocolate (Orem, UT) was made from cacao beans grown in Papua New Guinea. Two of the rich, complex flavor notes I picked up in this bar: raisin and roasted coffee. And yet, this bar has only 4 ingredients: cacao beans, pure cane sugar, cocoa butter, and whole vanilla beans. 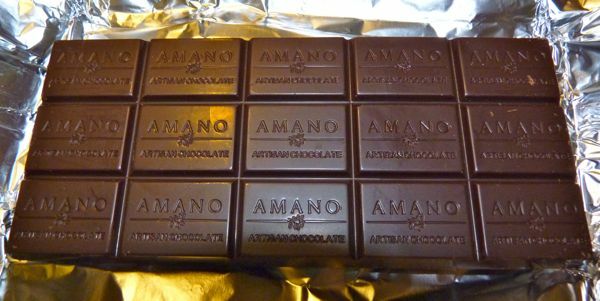 Amano also includes the following list of possible flavors you might detect under their Tasting Notes heading for this bar: red grapefruit, lime, blackberry, smoke and leather. How does one combine chocolate with leather? You'll just have to tune in this week to find out. Today was Day #1 of Chocolate and Leather Theme Week, with maybe a little lace thrown in too.